After their opportunity to shine on the big screen in Captain Underpants: The First Epic Movie, the misadventures of George, Harold, and the waistband warrior will continue in a brand new Netflix original series. Featuring all the action, thrill and laughs you would expect, DreamWorks Animation Television is pleased to present The Epic Tales of Captain Underpants (and it’s new super-catchy theme song)! 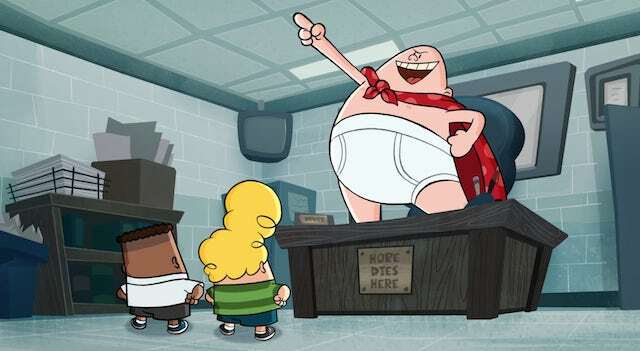 Taking inspiration from Dav Pilkey’s beloved novels and DreamWorks’ hilarious movie adaptation from last year, the series centres on troublemaking best friends George Beard and Harold Hutchens, who hypnotize their mean school principal Mr. Krupp into their dim-witted comic creation Captain Underpants. What could possibly go wrong? Although faithful to the books, this series will differ from last year’s movie, such as featuring an entirely new voice cast. Instead of adults, the kids will be voiced by child actors, including Ramone Hamilton (Blaze and the Monster Machines) as George, and Jay Gragnani (Bubble Guppies) as Harold. We also have Nat Faxon (Disenchantment) taking over as Mr. Krupp/Captain Underpants, and Sean Astin (Balto III: Wings of Change) serving as the narrator. Additionally, the series utilizes hand-drawn animation to faithfully replicate Pilkey’s illustrations, along with other animation types such as stop-motion. With the faithfulness of the books proudly shown in the intro, as well as Pilkey’s approval, this series looks to be a fun continuation that will be sure to satisfy fans (including me) and even newcomers alike. The first season of The Epic Tales of Captain Underpants will be available to stream on Netflix starting from July 13, 2018. What are your first impressions of the opening? Is the theme song already stuck in your head? Lets us know what you think!